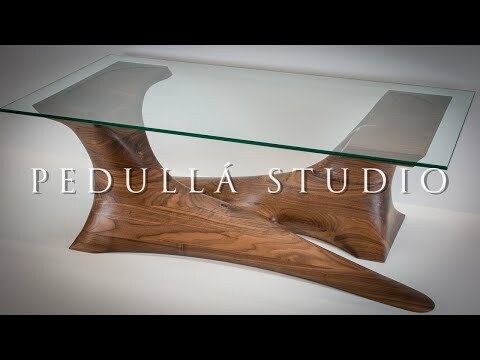 This Sculpted Coffee Table is made from solid Walnut consisting of around 20 pieces of timber all 40mm (1-1/2 inch) thick. Each piece is roughly cut then glued and stacked together to form the unique shape of the coffee table, a process known as stacked lamination. From this point I used an angle grinder with saburrtooth carving wheels and my festool and metabo sanders as well as numerous hand tools such as spokeshaves, files, rasps and planes to finesse the table to its final shape. Its finished in a wipe on poly then hand rubbed to a smooth finish using a thinned down food grade mineral oil. The top is 10mm toughened glass. More videos to come. Please subscribe and thanks for watching!